According to the old joke, “all countries have armies, but here, Army has a country”. 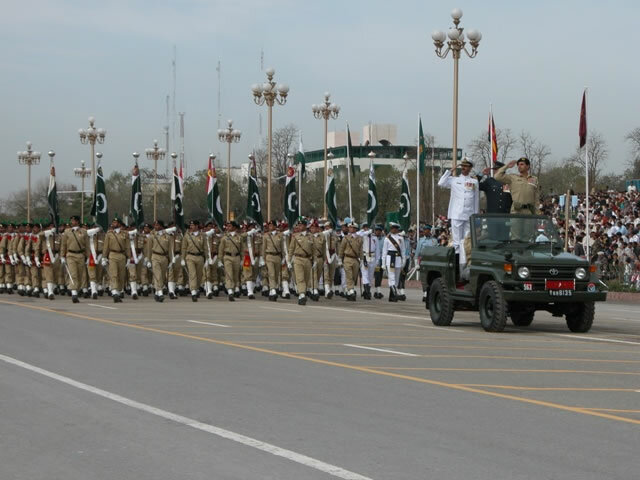 This was on full display as the nation’s capital came to a full halt for “Pakistan Day Parade” that consisted of little more than a celebration of Army. There was always something that bothered me a little about this, but I couldn’t really say what it was until I read this Tweet. It’s amazing how something so profound can be captured in so few words, but there it is. I realised what was bothering me wasn’t that the Army was featured in the celebration, but that it felt like Army was the only thing featured. As if Pakistan were an Army, and not a diverse nation of millions. 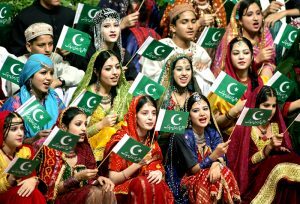 With the alienation of so many communities, Pakistan Day could have been an opportunity to put on display the various cultures and languages that make up our country. I am imagining a parade in which everyone was not dressed in a uniform, but in the different traditional dress of their community. I am imagining a parade in which religions were represented: Sunni, Shia, Sufi, Ahmedi, Christian, Hindu…all marching together as a demonstration that even though in some ways we are different, at the end of the day we are all Pakistanis. I am imagining a parade in which, instead of weapons, there were displayed representations from Punjabis, Sindhis, Pashtuns, Baloch, Hazaras, Saraikis, Kashmiris, Chitralis, Mohajirs. Where everyone is cheering and appreciating each others cultures, and remembering that it is from this combination that Pakistan is made. Instead we were shown troops. Officers. Missiles. Fighter jets. Drones. Pakistan Day 2015 was a proud day, but it was also a missed opportunity. We were reminded of the strength of our armed forces, but we once again ignored the essence of what it is that’s worth defending. Sindh Senior Minister Zulfikar Mirza’s recent statement against mohajirs this week was beyond the pale and has no place in politics. But rather than react in anger, we should take this opportunity to reflect on a poison that plagues politics and hold us back from realising our potential. The poison I’m speaking of is, of course, the prejudice and bigotry that continues to divide us against ourselves. To his credit, President Zardari is taking the member of his party to task, summoning him to the presidency and publicly scolding him in the press. “The president has asked Mr Mirza to suspend his political engagements in Sindh and immediately come to the presidency,” presidential spokesman Farhatullah Babar said. President Zardari is reported to have been annoyed by the statement in which Mr Mirza made derogatory remarks against MQM chief Altaf Hussain. “The Pakistan People`s Party has already disowned the statement and called upon its ranks to show restraint in public statements,” the spokesman said. Unfortunately, Mirza’s act is not unusual. Who can forget Altaf Hussain’s speech making fun of Punjabis? Or can we forget PML-N politicians objecting to cabinet member Kamran Michael presenting the budget on grounds that he is Christian? No, it is not one politician or one political party. Sadly, it has become a weapon to be pulled out when the speaker has no ideas worth giving. It is then that he can only resort to the lowest forms of attack against his fellow countrymen. It is a strategy of divide and conquer, and it has no place. Politics should be a battle of ideas, not a war of words. 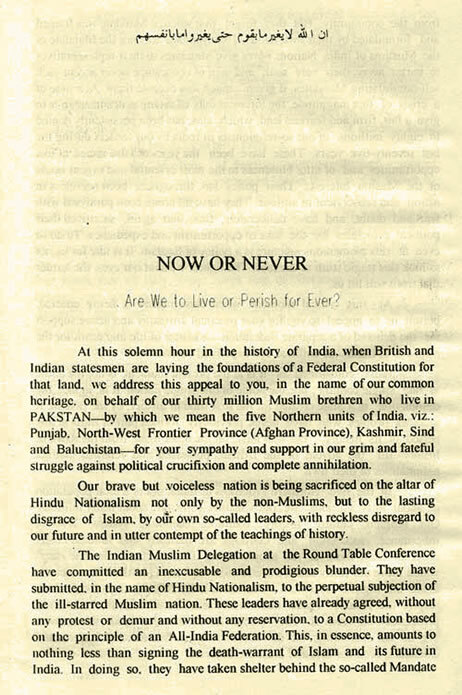 At this solemn hour in the history of India, when British and Indian statesmen are laying the foundations of a Federal Constitution for that land, we address this appeal to you, in the name of our common heritage, on behalf of our thirty million Muslim brethren who live in PAKSTAN – by which we mean the five Northern units of India, Viz: Punjab, North-West Frontier Province (Afghan Province), Kashmir, Sind and Baluchistan. 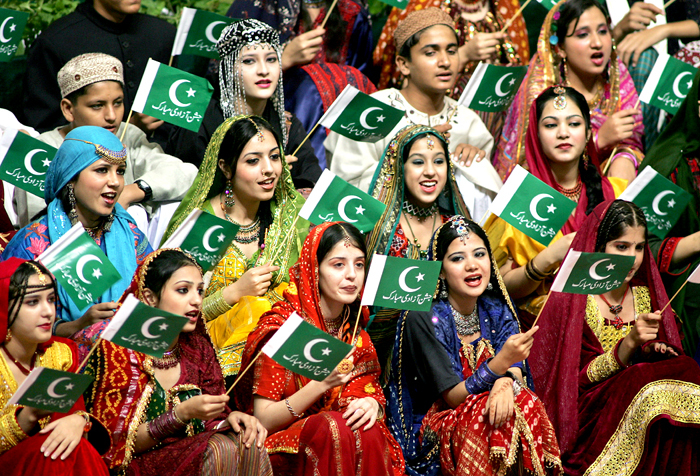 Baloch, Pakhtun, Punjabi, Mohajir, Sindhi, Sufi, Shia, Barlevi, Deobandi, Christian – We are all Pakistanis. A column in Pakistan Observer by Sajjad Shaukat calls on Pakistanis to “unite against the foreign enemies”. In case you don’t know who “the foreign enemies” are US, India, Afghanistan and Israel who “are in collusion as part of a plot to ‘destabilize’ Pakistan for their common strategic interests…while main aim remains to disintegrate the country”. This is an old conspiracy theory, and the author offers nothing new in the way of evidence to support the theory (there is none). But the way the author uses this conspiracy theory is what I think is interesting. He uses the alleged threat of ‘foreign hand’ as a national unifier to overcome ethnic differences. No doubt, since its inception, Pakistan has been facing ethnic, linguistic and communal problems but in order to unite against the foreign enemies, our national, provincial and regional leaders must stop manipulating these problems and disparities at the cost of federation, which have hindered the path of national unity. In this context, a blind dedication to one’s own race, tribe and creed should not be allowed to create hatred in one group against the other. Unity against the external enemies require that formation of alliances and counter alliances, based upon the principle of hostility for the sake of hostility should also be abandoned, while our politicians and leaders must eliminate lack of national cohesion among various segments of society. Besides, most of our regional and national parties which are divided on sectarian and ethnic lines should also stop manipulating the ongoing phenomenon of terrorism not only against one another but also against the armed forces. Otherwise, this selfish attitude will further block the path of national unity. Echoing the Asharite rejection of critical thinking in exchange for obedience and order, Sajjad Shaukat argues that the threat of disintegration “demands sacrifices of individual selfish interests from the citizen of every province including every religious and political organization”. He goes on to say that the masses are incapable of understanding events, and that the politicians are being manipulated by ‘foreign hand’. His solution? Everyone should defer to the military and ISI without question. Drastic implications of the situation cannot be grasped by the general masses at large, who abruptly change their opinion without reason. Hence, they become easy prey to the internal exploiters, unintentionally benefiting the external conspirators who want to weaken Pakistan by creating a rift between our general masses led by politicians and the security forces. Apart from it, foreign agents misguide the disgruntled elements that national institutions are not made to develop the backward areas, and policies formulated at Islamabad are not congenial to other provinces except Punjab. To castigate the conspiracy of the external enemies against the integrity of the country, our political leaders must avoid manipulating any crisis not only against one another but also against the security forces and ISI whose image are deliberately being tarnished by the external plotters. This is, essentially, a call for martial law. But Sajjad’s column also reminded me of something else I read recently – an article by Omar Ali, an academic physician living in the US. Exploring the question of whether Pakistan is descending into a ‘failed state’, Omar finds that it’s not, and that fears of ethnic clashes leading to the state disintegrating are based in gross exaggerations. First of all, it is very hard to break up a modern post-colonial state. It’s been done, but it is not easy and it is not the default setting. The modern world system is heavily invested in the integrity of nation states and while some states do fail in spite of that, this international consensus makes it difficult to get agreement on any rearrangement of borders. In most cases, distant powers as well as surrounding neighbors find it more convenient to find ways to compromise within existing borders. Even a spectacular failure, like the collapse of the Soviet empire, actually ends up validating already existing borders rather than creating entirely new ones. The supranational structure of the Soviet Union collapsed, but its component nations remained almost entirely within their existing borders. In this sense, Pakistan does not have 4 separate ethnically and culturally distinct units joined by weak supra-national bonds. Even an extremely unhappy component like Baluchistan is not uniformly Baloch. In fact, Balochis are probably no more than half the population of that province. Sindh contains large and very powerful Mohajir enclaves that do not easily make common cause with rural Sindh. More Pakhtoons live in Karachi than in the Pakhtoonkhwa capital of Peshawar. Economic and cultural links (especially the electronic media) unite more than they divide. If nothing else, cricket unites the nation. In addition, the reach of modern schooling and brainwashing is not to be underestimated. Even in far flung areas, many young people have grown up in a world where Pakistani nationalism is the default setting. Economically, the country is always in dire straits, but agribusiness and textiles are powerful sectors with real potential. More advanced sectors can easily take off if law and order improves a little and irrational barriers with India are lowered a little bit. The nation state is not as weak as it sometimes appears to be. Despite the doom and gloom headlines that we read every day, Pakistan is not heading towards ‘failed state’ status. That’s not to say there aren’t some bit problems, but things are getting better, even if it’s slower than we would like. And things are getting better as the democratic process takes root and the participants (politicians, justices, military, etc etc etc) figure out how to effectively operate in their new roles. We tried Sajjad Shaukat’s approach under Gen Ayub, Yahya Khan, Zia, Musharraf. The nation long-term effect of each of these regimes was negative. The mistakes of each of these rulers brought us to where we are today. Actually it was this approach to governing under Yahya Khan that did more damage to Pakistan’s unity than anything under democratic rule. 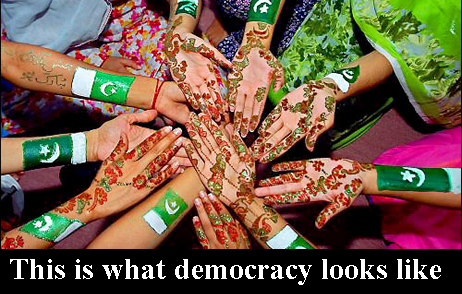 Rather than ignoring and suppressing ethnic, tribal, or religious diversity in Pakistan, we should be celebrating it. The way to secure Pakistan is through allowing every man, woman, and child a sense of belonging and national pride that recognizes and appreciates who they are as individuals also. This is what democracy looks like. It looks like Pakistan.